There is so much to explore across the Sunshine Coast Hinterland, and while it may seem to be endless green hills and country cafes, there are some unique and special experiences just waiting to be discovered during the holidays (or any time of year!). The rolling green hills, trickling streams and country roads of the hinterland are best enjoyed with a drink in hand, and cheese platter before you (in our humble opinion). 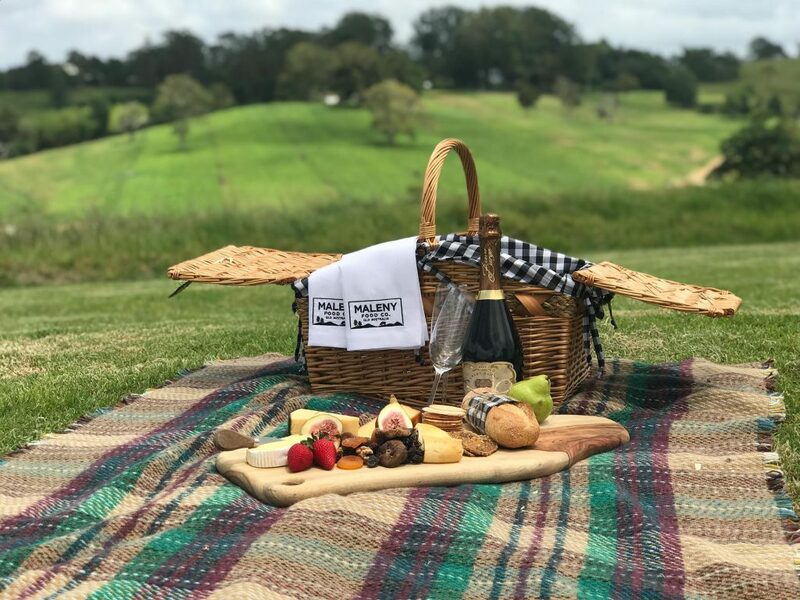 At Maleny Food Co we create cheese and picnic boxes to enjoy in the countryside. Each cheese, cured meat, and accompaniment is selected from our fromagerie, along with local produce and freshly made baked goods and breads from our café. Grab a picnic basket from our store and head off to one of the many beautiful picnic locations in the area. Read our blog for the top five hinterland picnic spots with the best views. Explore Maleny on foot and discover its not so hidden natural beauty. The Maleny Trail is a 6.7km walk lined with more than 18,000 trees and native plants, offers stunning look outs and perfect picnic spots. The walk starts at the Maleny Showground and makes its way to the “Peace in the Trees” sculptures, the Poetry Sculpture Trail, the Cloud Walk Pathway, and along the Obi Obi Creek – where you may be lucky enough to spot a platypus close to dawn or dusk. Ever wondered why Maleny Food Co gelato tastes so good? Because we source our milk daily from the beautiful guernsey girls who graze the lush green countryside on The Farm at Maleny. Maleny Dairies is open to visitors to explore and has a kiosk where you can pick up a coffee and light snack. You can also pick up a tub of our award-winning gelato to enjoy with gorgeous views across the paddocks. Visit the Maleny Dairies website. The Sunshine Coast Hinterland is a treasure trove of art galleries, just waiting to be explore and awed. From oils to watercolours, sculptures to textiles, there is a stunning array of artworks just waiting to be discovered. Best tackled over two days, we suggest starting at Art on Cairncross in the Blackall Range, which boasts some of the region’s top artists. Check out the full trail on Visit Sunshine Coast’s website. The Glasshouse Mountains offer something for everyone looking to disconnect and get back to nature. With easy walking tracks, to challenging summit routes, the natural beauty of these significant peaks has to be experienced. Named by Lieutenant James Cook as he sailed along Australia’s east coast, they comprise of 11 mountains, each with their own stunning lookouts and panoramic views. To find out about walking tracks, head to Visit Sunshine Coast’s website.